We saw yesterday at the depot in the process of shipment to its destination, a beautiful monument, to be erected by the people of the town of Cornwall, in memory of the deceased soldiers from that town. 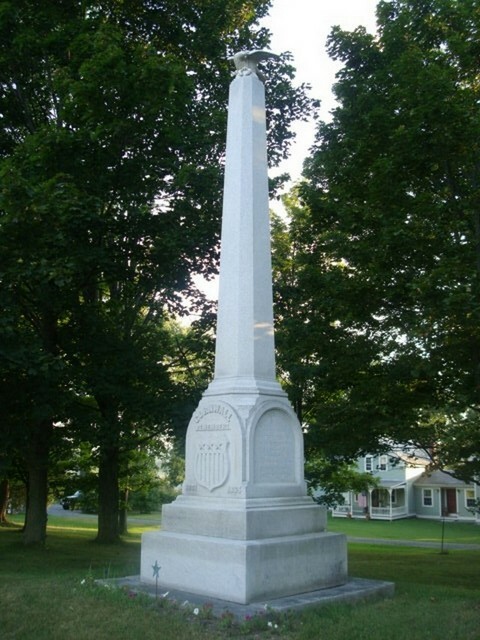 The monument is of Barre granite, with a die, upon the front of which is engraved "Cornwall Remembers." Below this is a shield, and in the lower corners of the die, '1861' '1865.' Upon the other faces of the died are inscribed the names of the soldiers who have died in the service from that town. The dimensions of the base are 5 feet 2 inches by 2 feet. The sub-base is 4 feet 2 inches by 15 inches. The die is 3 feet 2 inches square and 4 feet 2 inches in height. The shaft is octagonal, 12 feet 2 inches in height, by 2 feet at base and 13 inches at top.